This guide is about a summoner necro. Summoner necros have the habbit of being a little bit slow, but combined with the correct items/skills and most importantly, the correct merc, you can partly be even faster than a totemnec in terms of kill speed. We'll be focusing on the Death Fury totem and Howling totem to get the maximum out of this build. And we will use an act 1 merc: either the Priestress or the Ranger. -600+ MF when you reach level 120. So really good farmer build. The Necro's innate skill. Wall of rage that increases damage of allies that cross it. This skill is a really nice addition to an already well-working build. It boost physical damage and spell damage. We mainly use it to increase our physical damage output.
. 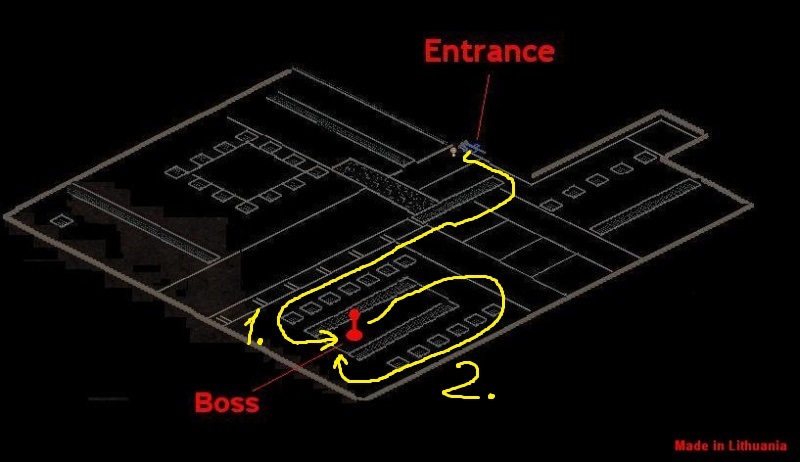 It is very useful for some uber bosses which would be harder if you used other skills. Skeletal flayers have replaced shadows in the latest patch. But the mechanics are still the same: They grant you an aura that increases your max life and your spell damage and in addition to that grants a life regeneration. We mainly need the life regeneration and the max life, as this slowly regenerate all of our minions and makes them tankier. Due to their low mana cost, we'll keep them on the left mouse button to easily make use of them as a target for our teleport. These summons have always been the top necro tankminions. You can summon up to 6 at once and in addition to having a huge amount of life and a big hitbox, they also have a poisoning attack, which drops enemies quite fast. The good hitbox is great to block incoming spells for us. That's exactly what we need. Lamias are basically ghosts from cLod. They can't block each other and can walk through everything. They also grant us a doom effect, which increases with Hardpoints. That's nice for early game, but later that doom effect is simply too low to actually be worth spending points into this skill. Lamias also slow down enemies and are thus a must-have skill against most bosses. The Veil King is the potentially deadliest summon we have. It has a 5% chance to instantly kill our enemy upon hit and also summons an army of Veil Terrors. But it also can turn hostile upon being killed. Due to its huge drawback, it is not adviced to use it. We have other sources of damage so we don't rely on VK. This is one of the best minions in the game. It has an AoE attack, blinds enemies, has an aura that reduces incoming damage and it slows enemie's attack speed. And the best part is: It's always good with just 1 base point invested. This is our source for Trielemental damage. Every base point increases its effect by 15% so we will want to max it. As for all totems, we require a corpse to summon it. This is our other huge buff skill. We summon a totem that increases all physical damage and in addition to that adds Crushing Blow to everyone close to you! This is the best damage buff in the game since it adds another 10% bonus damage per soft point. We need to max this simply because we need the crushing Blow and the damage bonus. We can summon up to 4 totems in early game. 2 are already in use. So what are we gonna do with the other 2? YES! We use the Frostclaw totem. We basically don't need to worry about it at all. It does huge amounts of damage in a short time even without -enemy cold resist and +cold spell damage. We won't use it until level 90 though, simply because we lack skillpoints and need to invest into our minions first. But after level 90 we'll max this. A passive that grants us the mana regeneration that we need, and gives all our minions and ourself a nice bonus to max life. Combined with Skeletal Flayers, we will end up with a good amount of life. Of course, we will max this. This spawns corpses and thus gives us the possbility to summon our totems. 1 Point is enough. This is our main mobility skill. Target a minion and cast. You'll be teleported right to your minion. This skill gets rid of the hassle of constantly re-summoning our totems. Base points only add MF, but don't change the cooldown or the vulnerability duration, so we simply leave it at 1 point. Bane lowers the resist near target minion. We only need it for certain ubers that have physical immune enemies. But other than that we won't use this at all. Now this is what we need. It makes maintaining our totems easier since it adds dodge per hardpoint. It also grants fcr. But we don't need it early game and only put some points into it once we reach level 90. This is one really nice skill. This is our access to avoid and tcd. Both is very important in places where piercing projectiles are thrown our way. Everything our minions can't tank makes us vulnerable. So it's really nice to have at least a little bit of defense and avoid. You won't want to use any other of the 3 free uberskills for most of the content. This skill greatly increases our killspeed. It buffs both, DFT and HT in effectiveness and tankiness. In addition to that it gives us a minion with a good AoE attack. We will use this skill in Farmruns (TA). 1st: You need lots of Gold from act 5 hatred on. Pick up all amulets, rings and apples. Sell amulets and rings asap, keep the apples till act 5, because in act 5 they are worth 7500 Gold instead of 5000. 2nd: as soon as you reach level 12, go to gheed, use the gold signet you received in the beginning and gamble a Long War Bow or a Short War Bow. Both are good. Give that one to your merc and make it unique asap. 3rd: Upgrade your Merc's weapon before you upgrade your own stuff. But keep the level requirement in mind (!). 4th: From terror on, pick up ALL rare circlets, coronets, tiaras, diadems and Marrow staffs. Ring Any rare rings with +skills and/or +resist. Mo with more resist to get to max value. To teleport over walls in case you're too lazy to walk around. It's also needed for BRC. -Socket your weapon with Perfect Bloodstones for more minion life. -You only need to get 75% minion resist as this is the max value for destruction. - Slow, tcd and the highest damage we can get on bows. mo'ed with ED, EWD and MF. Socket with ith runes (Later you can get Jah runes for another 30% ED). Make sure to put the mystic orbs on it before you socket the runes into it. - Adds strength damage bonus, which is even better than the elemental damage from Jitan's Kamon, and adds much more defenseObtainable from Gift Box Mo with ED for 200 ED in total, Total character defense and magic find. Socket with Lum runes for another +60% mf. - Rainbow damage and resist. Mo with ED, Total character defense and MF. Socket with Lum runes. Grants Dex, open wounds and ias. Mo with ED, total character defense and MF. Socket with Lum runes. - a good proc, CB, and resist. Adds enough strength in order for your merc to equip Shroud Royal! Mo with ED, TCD and MF. Socket with Lum runes. - Adds health, TCD and +to all stats. Adds enough strength in order for your merc to equip Shroud Royal! Mo with ED, TCD and MF. Socket with Lum runes. With this setup your merc will reach around 40 k defense on level 120. You can chose to use either priestress merc or ranger merc. Both will work fine and both have their advantages. -the number of arrows are limited, so in very dense area's your killspeed is limited as well. But that is only really noticable in cowlevel. -throws 1 arrow for every enemy on the screen. So she kills everything rather equally. However, she kills enemies close to you earlier. -can't kill enemies that stand in the 2nd line. She needs another shot in order to do so and thus her kill speed is limited in very crowded areas as well. To sum it up: those mercs are actually really similar. If you want to be able to kill bosses faster, use ranger. If you want your merc to be able to heal herself, use priestress. Their killspeed is about the same. 1-Point: Bend the Shadows, Void archon. You start with only skeletal flayers and Death fury totem. Cast DFT regularly to keep up the buff as this increases your killspeed a lot until you have access to Bend the Shadows. When you reach level 6, cast Frostclaw totems and 1 DFT in order to kill faster. When you finally reach level 12, go to gheed, use your signet of gold and buy any War or Battle Bow. Either is good, though a long war bow is prefered due to higher base damage and a better base damage of the unique version of the bow. Once your merc uses this bow she alone is enough to get you through hatred A1 and A2 already. You can farm Tristram until you're either level 18, or both a TU Marrow Staff and Shroud Royal have dropped from the gift box. Andariel: If you see her casting meteor shower, just teleport to a safe spot behind her, wait until no meteors are dropping anymore and get back to kill her. 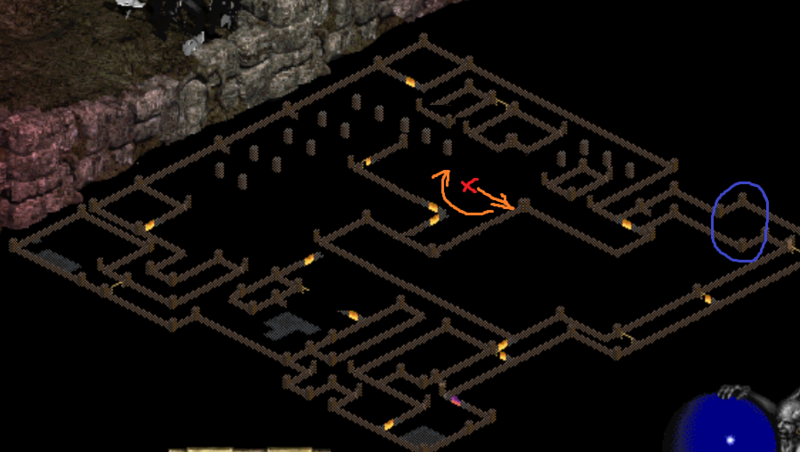 You can get to level 30 in the sewers in act 2, so you should use that place to find a long war bow, if you haven't gotten one from gheed earlier. Farm enough crystals by killing mephisto to get the long war bow of your merc to T3 or T4. By that time you should be around level 42-45. From this point on you can always go back and farm mephisto in order to get another arcane crystal whenever you notice your kill speed is going down. When you farm Mephisto, also make sure to pick up some armor with high defense for the upcoming level Challenge 1. This quest is relatively easy for us. You have many summons that can and will block arrows for you. Go to the Twin Seas in the Halls of the Dead. Then go to South/West of the map, where TA is located. Get the charm from the A2 Merc-lookalike enemy and progress further to kill the 3 priestresses. 1. You should teleport every 1-2 seconds. That way your minions stay by your side. 2. Don't teleport into the enemy head on. Now you can progress further. Go and kill Shenk 4 times so you can get 4 honorifics. Sell all your apples. You should have around 300-400 k Gold now. Now get 50% minion resist for terror. 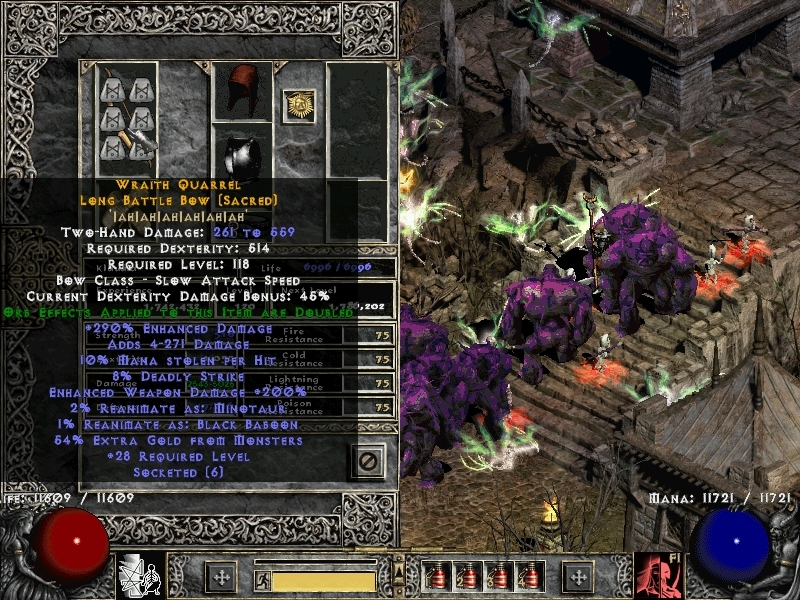 Run Baal until you reach level 60. If you find a jewel, pick it up and keep it in your inventory for the upcoming challenge. If you don't have a T6 Long War Bow at this point, I'd advice you to get one by farming Mephisto back in act 3. When all is set and done, go get your classcharm. This one is located in Kurast 300 BA in the Torajan Jungles (the first red portal once you enter the Torajan Jungles). If you spawn on the right side of the map, leave the game and open a new one. If you spawn anywhere else, go to the right side of the map. The necromancer there shouldn't have an immunity shield at all. Kill him as many times as it takes you to get a Soulstone Shard. Cube this with a jewel and done. Note: You can easily farm 5 perfect Bloodstones, Onyx, Turquoises and Ambers. You'll need them later in destruction. Note 2: This level in terror difficulty is a very good place to farm Rings and Amulets as well. Especially rare ones with + skills. You might want to run this level after level challenge 2 a few times. Now, while most builds suffer a heavy increase of difficulty when entering terror, this build is different. Your merc still kills everything, and now you should have some honorifics already with increased resist on it. While that isn't important in act 1 of Terror, it sure is in Act 2. Now sewers act 2 is the bullshittiest place for any low-max-life, low-armor build. Alpha centaurs will teleport on you, killing you with 1-2 hits and Porkchops will transform your whole army into uselessness, and tons of other enemies we'd rather want to avoid. Alpha centaurs are the only reason why we put points into vita at all. You should skip this one and return after you reached at least level 90.
btw: you should keep your eyes open for a sacred short war bow or sacred long war bow. You don't actually have to respec for this challenge if you went along with the previous skillplan. the only difference is having 1 point in Skeletal Flayers only (instead of 5-8), but you can do it either way. The only important thing is to have a maxed Frostclaw totem. It's also adviced that you get to level 84 at least before doing this challenge, just for the steamroll effect. So now we're ready go to The Swampy Pit level 3. That's the dungeon right next to the Flayer Jungle WP. The red cross shows where the DP is located in the map. The orange arrows show where the Death Projectors Death beam will first hit (the wall) and how it then will move. The blue Circle is where we will be located when we are preparing for the fight, resummoning everything. 1: we will move the DP's mechanics away from the DP itself. 2: we can make some time for the DP's beam to move around. The second teleport will bring us right to the South/West of the DP, making our frostclaw totems focus only the DP, while our minions tank the mechanics. Start casting Skeletal Flayers right into the face of the DP's mechanics so the skeletal flayers won't die but only be resummoned. Now just wait a few seconds and... Congratz! You just beat level Challenge 2. Now cube your class charm with any PGem and you get the bonus. 1-pointers: all summons and Bend the shadows. Before you go on you may want to farm Mephisto in terror if your gear isn't fully upgraded yet. That way you can also get to level 90 before starting act 4 (mostly because of heretics. If you don't have much armor, you'll die really fast). In addition to that make sure to slowly switch the ith runes in the bow of your merc with Jah runes for another 30% ED or what's even better: With the first few shrines and a rare sacred bow you can go on creating a first crafted bow with up to +300 additional max damage. That will greatly increase your damage output and clear speed. If you encounter Heretics, teleport a little bit back, so they will start following you. That way they don't attack and your merc can start killing them. For Detonators there's only one rule: teleport away asap! Once you're able to make Baalruns for exp, it's adviced to grab all the rare armors and sell them in town. From the gold you get, you'll advance your honorific gear and gamble Marrow Staffs. It doesn't matter which Tier those Marrow staffs are, because they still can spawn with nice stats. Get a staff with +12-13 to all Necromancer skills to progress easier. In this new patch Baal is actually "hard" (Or rather annoying). If you see the black mark on the ground, teleport away asap. If you encounter the summons of Baal, kill them, or else Baal will be immortal. Baal will teleport like crazy due to Frostclaw totem. That's why the fight may take longer than anticipated (it took me around 7 minutes). But that's really all you need to watch out for. He also has a Frostskill that pushes you back, so you can't really teleport on him for maximum damage and he has a manaburn skill. But the latter doesn't really affect us. The first one is the Trial of Fear. Go to the hole level 2. Make sure to UNSUMMON ALL LAMIAS and your VOID ARCHON. The reason for that is: Lamias slow the enemy greatly. Even to the point where the butcher can't get into the circle before it wears off. So you're better off not using them for this uber. The Void Archon slows the attack speed down and even worse: he blinds the butcher and thus the circle won't appear. You can use 5 frostclaw totems or 3 frostclaw totems + DFT + HT. It really doesn't matter. Summon the butcher, wait for the circle to spawn in a direction where you can teleport, then rapidly cast Bend the shadows on the same spot. That way your minions won't block him from going into the circle. When you get the swirls, cube the class charm within 30 seconds and you're done. Take 666.666 Gold from your stash into the inventory, cube the class charm while there are no swirls around you, and done. This is the third Trial. Go to the Arreat Summit, Kill the ancients, use Dark Portal, teleport around like and idiot until King Koth is dead, and cube the charm. 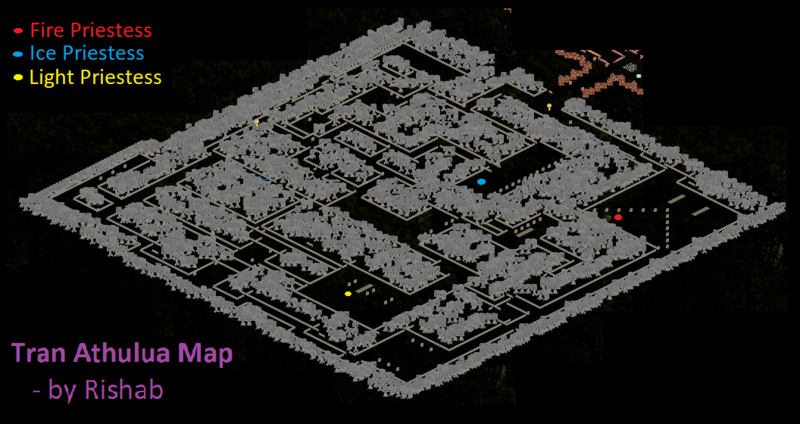 Thanks to Aerial for the map! for the blink. If you didn't create it yet, do it now. There's not much you have to watch out for. Physical immunes are killed by your minions and the Frostclaw totem, everything else dies to your merc. The only thing you really have to look out for are the barrier strikes. They can push you back and eventually stunlock you or your merc. Just make sure to not stay close to walls, or anything else that blocks your path and you'll be fine. And don't gather your minions too often, else the Necrobots will all focus on 1 point. That means you'll get hit much more often since their attacks can pierce your meatshield. You can only get to Brain 1 by teleporting over the wall. Brain 2 is inside the big house. You can also teleport into it. Brain 3 and 5 are in open areas. You may want to progress slowly since especially near brain 5 there will be tons of enemies. Then, if you take that long road where brain 5 is located, to the North/East, you can teleport over the wall as well to get to Brain 4. You don't have to take the green path to get there. When you have gathered all 5 brains, go ahead and cube them with your class charm. Done. So now for the last and most time-consuming of the 5 challenges. While every challenge before was simply a piece of cake, this one is actually hard because you have to actually keep enemies alive instead of killing them. And as a summoner this is really hard. Note: I did this challenge without respeccing, but it is easier if you just respec. This challenge takes about 40 minutes - 1 hour, so I couldn't upload a video of it unfortunately. - respec: Max Death Ward, Embalming, Stormeye totem and frostclaw totem, 1 point into Bend the shadows and 1 in all summons. Put the rest into skeletal Flayers and Nightwalker. - get 50-100 k defense to not die in an instant. - make sure you have 1 spare Belladonna elixier because we're going to respec back to our normal build after this. When you prepared everything go to Tran Athulua in Terror. These images shows exactly how to do it. The purple line shows where you're coming from. The red lines show the areas you have to clear completely. Don't let a single amazon survive. You can use any summons and any totems as you please in this area (except Veil King). While you're at it, make a TP where the green cross is. Once the area is clear, unsummon all Rampagors and Lamias. The blue line shows where you should only use Skeletal Flayers and Frostclaw totem. A Void archon is fine as well. Once you encounter the ice amazon go back. Walk, don't teleport! Let your totems stay there to kill off the casual amazons. You have to bait few amazons one by one into your totems at this point. Once you cleared the area and only the main amazon is left, teleport away and unsummon everything. Equip Pax Mystica, keep Blink on the RMB and lure the amazon to the Blue circle. Then teleport over the wall. Alright. One amazon is in position. The yellow line shows where you should only use Skeletal Flayers and Stormeye totem.. A VA is fine as well. Now use the same kind of strategy you used on the first amazon. Only kill few amazons at a time. 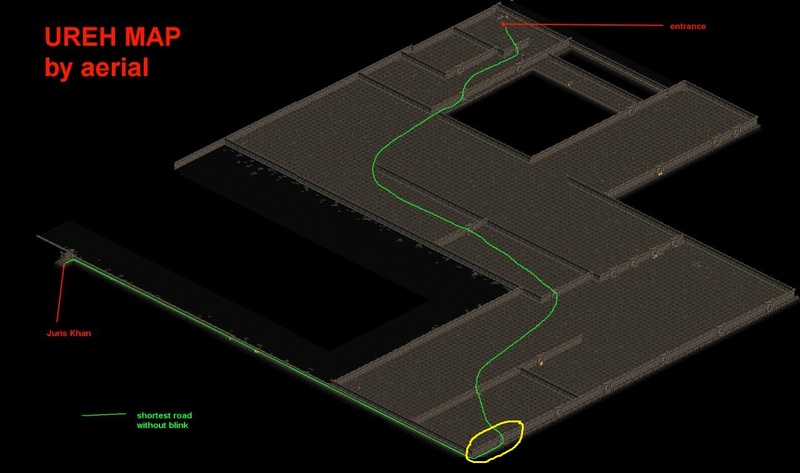 This time it is important to walk/teleport only at the bottom. Right near the wall. That prevents that too many amazons can see and attack you. Before you reach the end of the wall, the lightning amazon will come out of hiding. Once she is isolated, teleport back, unsummon everything and lure her to the yellow circle. And that's exactly where your TP is. Now all you need to do is go into the sewers level 1, summon all you've got, summon Frostclaw and Stormeye totems, equip Blink from Pax Mystica to your RMB, go through your TP back to TA, kill the first amazon, teleport over the wall, and kill the second. Now you only need to cube your class charm with nothing in your cube and Done. Alright now all you need to do is farm 2 arcane crystals in TA and cube them with your class charm. Edited by HechtHeftig 1 year. I only recorded new videos for the ubers that have changed. Don't summon Lamias and Void archon, lure him into his circle and let Frostclaw totems kill him. There's nothing you have to watch out for except: don't get swarmed. Just move around and kill the adds, then move to Tal Rasha and kill him. This is actually a good farming location. You can easily get lots of signets of learning here. Sometimes the mobs even drop Greater signets of learning (+5 stats) and you can find Signets of skill in this level as well. You can use up to 3 of those, so farm this area while doing the quests below until you have gathered all 3 signets of skill and some good charms (or even trophys). Since we won't farm K3K we can simply kill the summoner in the right corner to eventually get the charm. There is a map where the entrance is on the right side. If that happens, reroll the map because you'd need to kill at least 1 totem to kill a Summoner. And that's just not worth the time. to teleport on the totems and let your summons deal with them. Why terror? It's quicker and it's safer. The Guardsmen grant an aura to Aldric Jitan so you need to kill them first. Then go ahead and kill the guardsmen. If you killed all, and Jitan is still invulnerable, teleport past him and kill the rest of the Guardsmen that are still alive. Afterwards just kill Jitan. Don't get to close to the Guardsmen as they cast singularity on death. If you don't want to get hit the towers that they spawn just keep moving in circles or hide behind minions. There's nothing you have to watch out for. This has become a little bit harder, but it's still easy. You just need to move around at first, because the golems on Death proc can be very devastating. If you feel like there are too many fireballs flying around, exit the room and recover a bit. After you've cleared most golems, you can go back and teleport a little bit below Bartuc. That way your frostclaw totems can attack him freely. Notice that you need to leave some golems so Bartuc will lose his immunity shield. Teganze is farily easy. It may take some time to kill the enemies, but you're able to do that. There's no special strategy for Terul either. See the video below to know where you have to teleport in order to get an easy kill. Just avoid the instant-killing attack of the Creature of the Flame and let your army do the rest. With the removal of Lantern Archons, this uber has become a viable farming place. I haven't farmed much yet, but the general base seems to be unique, and it's really fast to progress through the level, so for an easy farming place (easier than TA) it's good enough. Your merc probably won't die here if you ignore Malthael/Imperius. -Once the avatars die, they release a meteor shower. Continue moving to avoid it. -The towers will shoot out punisher all the time. Their target turn mechanism is slow. That means, if the tower shoots in the opposite of your direction first, it will take another few shoots until it actually targets you. So if you stay in once place for ~ 20 seconds, you'll be targeted. Sometimes it's even earlier. In order to avoid it, continue moving. -On the south part of the map either Imperius or Malthael spawn. Kill them and cast black portal in order to access the Diamond Gates for Judgement Day quest. Sometimes they cast an immunity shield. If that happens, go back to town, wait for 30 seconds and get back to Khalimgrad. They also like to cast Beacon. Move away in order to avoid it. So first of all, go to the right to kill Malic. His slow-moving red homing bolts can kill you in an instant, so watch out. I'd advice to constantly teleport around him and let your merc/minions/totems finish him off. Lucion emits an invulnerability shield to all monsters nearby. So Lure the monsters away to kill them seperately. If you feel like you have lured away enough enemies, go a little bit closer and your merc will finish him. Watch out: Lucion might teleport on being hit. You may have to follow him. There's nothing you have to watch out for. Just Port around and your merc will kill everything. Now: Don't kill Baal for now! He's very strong and you won't be able to kill him! This uber hasn't changed much. The only difference is that you're more mobile and that you can gather as may nephalem spirits as you want. The tremor they cast has been nerfed and thus this uber has become a bit easier. And they don't always teleport on you, giving you more space to run away. Strategy: Gather 4 spirits (or as many as you like) by teleporting through the level. Once you've found a spot that you like, teleport until none of those spirits teleports on you, then cast skeletal flayers into their face. As long as those spirits attack, they'll eventually spawn Malthael and/or Imperius. If you hear the computer voice saing "Nuclear strike detected", teleport away, gather in a new location and prepare the same way as before: Make sure that none of those spirits teleported on you, then cast skeletal flayers in their face. If your totems die, recast them. That's it for the strategy. Once you've killed both Imperius and Malthael, drink a potion, and cube your crystalline flame medallion with an empty cube. This uber is most of the time easy. But it can take some time and you eventually die when Imperius and Malthael start summoning even more enemies. That's why I think this uber is moderate. Note: Sometimes minions will not gather exactly around the enemies and they simply walk away to the other side of your screen. That shouldn't affect you however, as long as you keep casting skeletal flayers in their face. Gloves: Honorific Sacred Gauntlets Blessed with Magical shrine for another 30% minion life, Mo'ed with Minion Life, MF, ED, Cold spell damage and 2 orbs of minion resist. -->Magical Shrine Crafted Gauntlets Mo'ed with minion life, MF and cold spell damage. This item has, just like Pax mystica a Blink charge. I always prefer Blink over the other teleporting skills like Jitan's Gate because it has such a low cooldown. Plus you can make use of Psionic Storm oskill for some ubers. Shield: crafted Necromancer shield (any shrine is okay) with hounfor oskill. Use that oskill first, step into the circle, and then summon your totems. That way your totems will be a lot stronger. You can farm Magical Shrines in Kurast 3000 BA in Terror. You can also get a good amount of rare jewels there, rings and amuletts there. Why are we using a honorific in gloves? We need some good armor for Fauztinville later on. The easiest way is to either shrine craft or create honorifics for our needs. We don't put all resist on those items anymore, because we can put up to 4 Pgems in their sockets for 20% all resist. All crafted defensive items (except armor) can Spawn with +30% minion life. Bless them for the chance of another 30%, Mo another 40% on them. So the max value is: 100% minion life. on gloves and boots and belts. Please note that this is also your endgame gear. There simply is no better gear in the game. 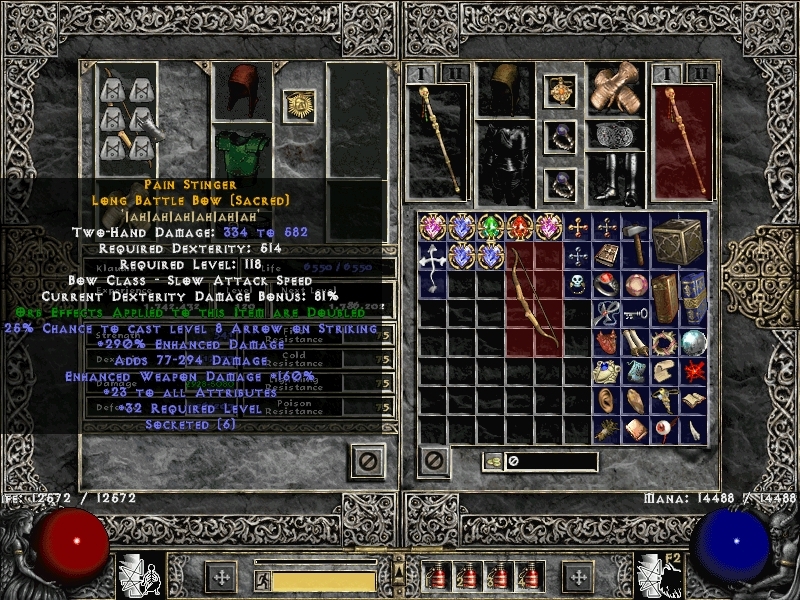 Weapon: Crafted Sacred Long War Bow or Crafted Sacred Short War BowAny shrine is okay, Get high ED and proc, Mo with EWD, socket with Jah runes. This will also be your mercs endgame bow. Concerning the rest of the gear: Either use the early game gear or any item that can improve the damage and the survivability of your merc. It really doesn't matter since most of the damage comes from our totems and the bow anyway. Everything else: Abondoned craft (Dex bonus) or other SU's that add flat damage and have a nice defensive value. 1. Always be on the move. 3. If you go north, summon shadows behind your enemies to make broadsides target those minions first. That way your merc has higher probability to survive. 4. If you go south, regularly cast bend the shadows. Never stay close to southern wall, since your minions can't block the projectiles if the arrows come flying from the south. 5. If you get swarmed, or if you feel that there are too many amazons around you, teleport back. 6. If you don't know where to teleport, teleport right on spot to keep your minions together. 7. Don't attempt the lightning priestress. (Magnetic Field's damage is insane and since we don't have much armor at this point since we chose to use Rathma's chosen for a much better killspeed, we don't want to follow her. So if you're in the lightning priestress' room, teleport north by clinging to the eastern wall. we can survive here easily. Just stay close to your minions. As you search for your midgame gear in TA, make sure to pick up all Tiered uniques as well. You want to make arcane crystals for Jewelcrafting because that will take really long. You can find rare jewels in TA as well.
) The recent patch took lots of killspeed from us in this particular level. Necrobots will hit you due to the piercing attacks. And the elemental damage boost from DFT is not enough to kill those necrobots quick enough. That's why we will use Fireheart totem for this uber. Don't worry, you don't need any -enemy fire resistance to be successful. Summon 1 Howling Totem and 4 Fireheart totem. Those totems will burn away 1 necrobot with 2 flame attacks. Strategy: Teleport to a place, then cast skeletal flayers all around you. Once the main mob of enemies has died, get closer to the necrobots and let your totems deal with them. Then continue. There are also enemies that cast Blade barrier, but that shouldn't be a bother as long as you stay in the middle of the road at all times. If you do get knocked back, teleport to gather your minions. I was relatively safe with only 130 k defense and I didn't even have Goetia Plate yet. Thanks to FK65 for the strategy for this uber. Note: avoid narrow alleys as Necrobots will have an easier time to kill us if they attack you from off-screen. Once you have some of your midgame gear gathered, you're ready to do some more uberquests. Idol of Vanity is one that only requires you to avoid the big Lazorbeam that's coming from the Crystal ball. In general, it's like killing the Death Projector: you only have to teleport to the South/West of the Crystall ball and let your summons do the rest. The only difference is: the Lazorbeam for the Crystall Ball is moving counter-clockwise. That's why we have to wait until the lazor depletes until we can position ourselves right next to the Crystall Ball. Once the Crystall Ball is destroyed this uber turns out to be a piece of cake. You can kill the 2 Summoners and Inarius now since the invulnerablity shield the Crystall Ball gave dropped. Inarius will then drop the Idol of Vanity. This uber can be tricky if you don't know what's happening due to the insta-kill mechanic. So better watch my video where you can see how to finish it and note where I'm standing to avoid the lazorbeam. Actually this one really depends on how many enemies were spawned. In any case, you should use Blink rather than Bend the Shadows for the simple reason that you don't want to teleport to a place where you're easily swarmed. Plus you may not get the chance to summon a minion through the first small door. Compared to the previous patch, the uber has become easier for tis build because the location changed. It took my only 11 minutes for killing him (previously ~30-40 minutes.
. The Psionic storm hits multiple times and damage is okay considering we don't have much +spelldamage. By the way: Psionic Storm is NOT affected by any spelldamge. The only way to increase its damage is to put points into energy. So it's best killing him with 500 sigs eaten, however in my run my nec didn't reach that point yet. You can also use Boneyard. Remember that if you use boneyard, you have to hit the wall next to Quov Tsin to hurt him! Our goal is to never look QT in the face, so we need something that can shoot around corners. For this playstyle it's NOT adviced to use Funeral Pyre. It requires you to target QT, which is why it'll take longer since you can only shoot for 1-2 seconds and then have to go back into hiding. Anyway. The videos below show my run. Summon him, shoot your stuff around corners, always have a tp open, have enough potions in your inventory and dodge those slow moving bone spears as they will instantly kill you. And that's it. You may die a couple of times but that's nothing to worry about. This uber has become really annoying. There's a 2-3 screenwide attack (probably traps or on-death procs from some enemy) that curses your army. That curse will drain the life of you and your minions. The minions affected will die very fast no matter how much life they had. This attack is everywhere and there's no chance to hide. At first it's nothing that should bother you. When there's still lots of enemies around your army should be gathered and that curse won't affect your whole army. So you can just resummon minions while you teleport through the level. But when you fight Belial your army is reduced to ashes really fast. Before attempting Belial, clear the whole area. The strategy against Beliel basically stays the same: Throw minions into the face of him while your 5 frostclaw totems attack Belial from the rear. However, you have to retreat when your army dies off. The best is to retreat 2-3 screens away, teleport to town, resummoning your army and go back in. for the simple reason that Necromorbs are physically immune. Our banshees can quickly kill them off though due to their high elemental damage from our totems. And yeah... that's much faster if you have 34 of them instead of 14. Plus you have to resummon your minions a lot due to high physical damage from the souls, high poison damage and the barrels. All in all it's simply safer to have more minions. Anyway, sometimes the Necromorbs bug themselves in the wall. They still can hurt you, but your banshees can't reach them. The same is true for your Frostclaw totems. That's when you'll use funeral Pyre to deal with them. Gathering the sigils and the ring is no problem. But Assur needs some preperation. First of all: None of your minions will last long against him. Even you will probably die lots of times when fighting him. The trick is to use Jinns. They are fire immune and when they souround assur it's easy. But it's a bit annoying to get to that point. I died about 15 times to get my Jinns in the correct position. That's just because I'm bad and haven't done him for ages, so I wasn't mentally prepared at all I think the next try will be easier. So what do you need to do this uber? 1 or 2 Belladonna elixiers. At first you want to use Death Ward to get to him. Then, when you're close to him, respec to Jinns. Summon a couple of Jinns in his face, then start spamming Purify. Then when you're done you may want to respec to Death Ward again. The entrance to the Torajan Cemetery is at the bottom right of the Teganze Map. Another place I didn't attempt yet simply because I didn't need the drops (Great Runes). However, this is very easy for us as well. Lightning Arena stuns the enemies. Just teleport to a stunned enemy, the edyrems will let them drop their shield, our minions attack them and they are dead in an instant. Kill the enemies one by one. This uber has become a little more difficult. Mainly because Lillith is now located at the other side of Toraja. And it looks a little bit like a cage. My plan was to kill the enemies she spawns one by one and then kill her when she isn't crowded (that worked in my previous attempt). In my video you can then see my change of plans: I lure all of those minions away, knowing that Lillith is blocked by all those archers. Then I teleport over those minions back to the "cage" where Lillith spawns and kill those archers that are left. Until Lillith finally joins up with me without her bodyguards, making her an easy kill. When you get the swirls, teleport back to town, and cube your Crystalline Flame Medallion with an Arcane Crystal. Alright at this stage we basically achieved what we wanted. We can farm all farming areas. Duncraig, Torajan Jungle, Teganze, Tran Athulua, Fauztinville and Toraja. At this stage of the game you can go on farming for your other characters or for trading purposes. So for now, this guide is basically finished. I will still attempt the other ubers and let you know how to beat them once I find a way to get it done. Shield: Crafted Necromancer Shield (any shrine is okay) with Hounfor oskill. For this we need to respec and adjust our items. Get as much poison spell damage and -enemy poison resist you can! It's best to use crafted gloves, belt, boots and a crafted circlet (shrine crafted with shimmering shrines). I had -93 enemy poison resist and 164% poison spell damage (Burning veil not included) Please note, that -enemy poison resist is by far better than poison spell damage, since we already gain lots of spell damage from burning veil. It is most likely possible to kill Baal without all that gear, but the gear will make it much easier. If you think you won't get a disconnect or play SP, you can also just go to baal and kill the 5 waves and respec afterwards. That way you will have pestilence to get some damage on baal while Graveyard isn't active, hence you can kill Baal faster. First play as usual and let your merc carry you until you reach the throne room of Baal. Let him summon all the 5 waves and kill them. Then unsummon everything, make a tp and go straight into the Worldstone Chamber so Baal can quickly kill your merc (else Baal might summon even more enemies... You want to avoid that). You might die in the process. Now respawn, go through the TP, cast Deathlord, cast Burning Veil, walk through Burning Veil, cast Graveyard and go and kill Baal. Make sure to keep a tp up in the throne room because you will inevitably die in the process. So why are we using this spec? 1: Deathlord grants lots of defense which we need in order to move freely if he dares to summon something. 2: Graveyard does absurd amounts of damage with the correct gear (mine wasn't even perfect and still I had ~3,5 million damage with 1 punisher from Graveyard. 3: You can't get to Baal if you don't have your merc killing the waves in the throne room. So you still need to rely on your merc in order to get there. You might as well only respec after clearing the room, but I like the idea of having the spec for a full run. After all if you play on realm, you might suffer a disconnect and thus waste a belladonna elixier. Bull Price Rodeo is really easy. You just need to lure him close to a wall (a wall that prevents his walking cow attack to explode next to you) and wait for the kill. Video below. It became even easier in the latest patch, since he can't knock you back if your summons block his knockback. First of all, summon everything you've got and make sure to have a hotkey for a tp. Basically you first want to get to the yellow circle first. On the way there you may notice your minions dying one by one. If you think your minion count is too low, open a tp and go back immediately. Make sure to do this when your minions block enemies and that you have some space to do so. I had to port back to town a couple of times before I reached the yellow circle. If you get hit by a poison attack, drink a potion and you'll be safe for a little while longer. If you get hit by a Deathwarden's retaliate attack though... that can end up with your death if you're unlucky since you may be swarmed by zombies. There are 2 ways to prevent that: 1st: don't come close to any Deathwarden. 2nd: if you're swarmed, try teleporting to a safe minion and instantly start moving again. When you reach the yellow circle, you're basically at the bridge. That's where the fun begins and you can settle down a bit. First of all, go back to town again, summon your totems at some random waypoint, revive your merc, resummon all your minions and go back. Once you've reached the bridge you can start teleporting again. Wait for the zombies to be lured to your minions, then teleport further. Repeat this until you reach Juris Khan. Occasionally there will be some Deathwardens blocking your way. Let your lamias take care of them, but careful! When they die they cast tremor, which takes away 80% of your current life. Whenever you kill 1 or 2 Deathwardens you may want to return to town in order to heal your minions and your merc at Akara (minions are more important than your merc in this level). Once you reach the end of the bridge (you'll notice that the light changes to a warmer color), go back again and make sure your army is fully healed. Then go back and port into the corner. Once you do, the zombies will go on swarming you again. That's when you can teleport behind Juris Khan and let your summons kill him. Now grab the charm and gtfo of there. This uber is considered tricky because there's a lot that you can mess up. For example if you don't see the safe path you may end up swarmed. If you get stunlocked you're basically dead. If a punisher hits you you must be damn lucky to not die right afterwards. And even if you killed Juris Khan you can still die to the zombies before you grabbed the charm. While you have to be quick at thinking and clicking in this whole stage, you have to be the quickest once Juris Khan is dead. But I have to say, this uber is much easier with this build than with the Lazydin I played last ladder simply because you have so many minions that block enemies and lure them away from you. Plus the bridge is much easier when you don't let yourself get swarmed and keep your minions between you and the enemies. A curse that transforms you into a maggot, making you unable to cast spells, slows you down and reduces your resist in a way that his other spells 1-shot you. some poison clouds of which I forgot the name. So how do we deal with all of those spells?
. That way we have a high-level Psionic storm oskill that can easily deal with Xazax (alternatively: use Funeral Pyre. L H has a video for that in his totemancer guide). Make sure to RUN at all times, as you need the additional movement speed. The poison clouds aren't hitting hard. You can just ignore them. The punisher nova will reduce your life by around 50%, so that's nothing that a good ol' pot can't deal with. However the other 3 skills are something you have to watch out for. Xazax likes to cast a meteor shower right after transforming you into a maggot. That way your movement speed is reduced and you barely get out of there in time. But you can do it. The meteor shower can 1-hit you, so you have to avoid it if possible. The last thing that can harm you are the pentinents. Those are the untargetable enemies that he summons. They have an AoE melee attack and they can stunlock you, so make sure to not stay close to them. I prefer parking them in a corner instead of constantly hit and run xazax: First of all make the pentinents follow you. When you reach the corner, summon multiple Skeletal flayers in a bit of a distance from them (so they get blocked by your SF and have to switch target) and then run away. Don't forget where you parked them and don't get close there for the rest of the fight. Except if Xazax summons some more. Ofc you have to park them at the same place again. This strategy works against up to 10 sentinents. Maybe even more if you can pull it off, but at some point there will be simply too many and you'll have to switch to the casual hit and run tactics. Once the pentinents are parked, you can go ahead and spam Psionic storm on xazax. Only move when you see the meteor shower. 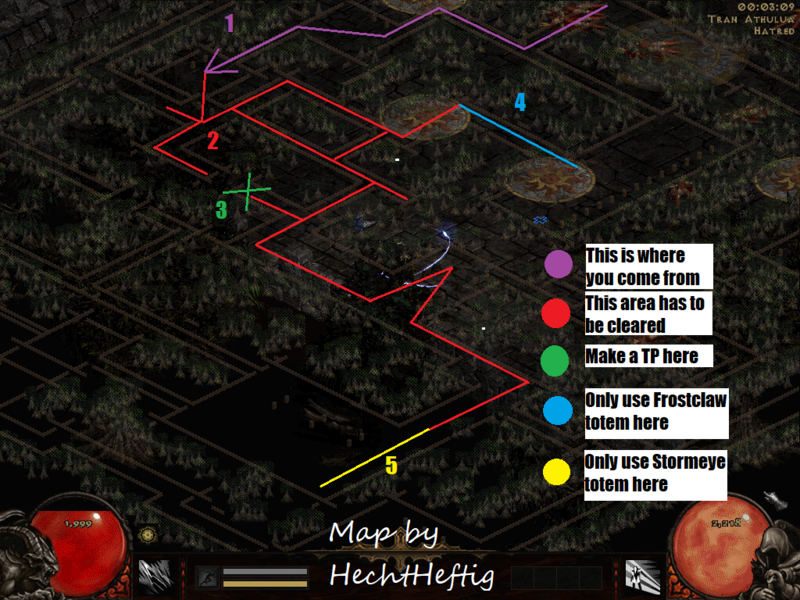 Other than that there is no need to move once you have namelocked Xazax and spam psionic storm on him from off-screen. In the video I was really lucky because Xazax only summoned 4 sentinents in the whole fight. But I tried it before and there were like 20 of those guys. Only hit and run tactics works against that. With the correct strategy this uber is rather easy. But if you don't know the strategy it's really hard/impossible to do. Anyway: A big thanks to Spinaker at this point for giving me a good strategy to do this uber. First of all: You want a high amount of defense (around 220-250 k) so you can survive here. And make sure to have Boneyard on a button that you can easily reach. You can't count on your minions or merc this time. Your minions will be frozen 80% of the time and your merc won't do much damage since the enemies teleport right on you. That means that there isn't enough space for the arrows to hit the next enemy and they'll basically do no damage. So you can't count on your merc either. You will have to change quickly between teleporting and casting Boneyard. Boneyard is luckily a very good AoE attack with high damage and only 1 base point invested. Make sure to do that quickly, else you might give the enemies the little time needed to kill you. I didn't try that uber before simply because we don't rely on the bonus you get from it. At some point you don't want to put more points into Death Ward/Howling totem simply because those were better invested in Frostclaw totem (I usually have 10 points in it to get them to 1 k damage at least). And the +15 minion resist really is a joke considering we use 2 crafts and get a set bonus from Laz belt and Laz helm. This uber can be done, but it's not necessarily important for this build. That's why I didn't attempt it before. Just walk in there, use Purify on the Master Control System (MCS) and done. Sounds easy? Wrong. First of all: there are thousands of enemies and once you enter the protected zone, there will be even more enemies summoned. Forget about killing them. Just keep moving. Oh and btw: the protected zone has even more cancer for us. There are thousands of traps deployed at any given moment to make you run even more. So once you used purify on it you'll be done, huh? WRONG. You have to use purify a 2nd time in order to really kill MCS. Teleport all the time. There are maybe some enemies blocking your teleport since your skeletal flayers are so tiny. So use the gaps the enemies create to move forward. Once you're close to MCS, get as close to it as possible (most likely not possible on your first few attempts because of enemies blocking your way) and use purify. Now you can choose: Either go for a nice long walk around to get into a better position on your next try, or make a tp right next to MCS and go back, resummon everything, wait a little bit until things have cooled down and go for it again. You may need a couple of tries until you get the hang of it and until you're lucky enough to be able to teleport right next to the MCS. Q: Can only circlets spawn with +3 skills? What about Tiaras? A: For crafting we need a circlet-type item. That includes Tiaras, Diadems, Coronets and Circlet. Q: The endgame gear is the same as the midgame gear. Is that a mistake? How can I further improve my character? A: There simply isn't any better gear in the game. Once you have gathered the midgame gear your character is basically finished. You can still improve your character with IST-crafted jewels (20% minion life each). Q: I may have a good clearspeed but I can't find Goetia Plate. What can I do? A: Either socket lum runes in all of your armors and/or use honorific Gear. You can get 40% Mf from each honorific + another 10% for each Lum rune. That should increase your MF by enough to get Goetia Plate easily. Q: Does my mf work if a minion gets the kill? Is mf on summoner useless? A: Your minions do benefit from your MF. And your merc benefits both from the MF that you have on your gear + the MF from the gear of your merc. That means that you can theoretically reach even higher amounts of MF with this build than with any other build. Q: I couldn't find Kerrigans Chest or Manastorm and thus I don't have Psyonic Storm to kill bosses. A: You can still use Boneyard or Funeral Pyre. Both are good spells to do it. However Boneyard is tricky to aim and Funeral Pyre requires you to be in the direct field of view of the enemy. For enemies like Quov Tsin the latter is a bit hard. However all the bosses presented can be killed with either of those 2 skills. A: If you have Santa Compana already, and cast any of those 2 from your weapon switch, all the additional minions from Santa Compana will die instantly. So these items aren't suitable for a summoner that uses Santa Compana. Q: Why don't you use Jinns? A summoner without all summons doesn't make sense, does it? A: It's personal preference tbh. Some ubers require more defense due to piercing attacks or open spaces for attacks due to your minions scattering. The latter results from slow killing speed. Death Ward is great to dodge that all and grants us a lazy playstyle. Q: Why don't you use Fireheart totem? A: Fireheart totem is good against groups of enemies. However, we already have the merc that takes care of groups of enemies. Frostclaw totem however is very strong against single targets with minimal investment. That's why Frostclaw totem is much better for this build than Fireheart totem. Q: What's the minion life cap? A: It's around 240 k. You don't have to worry at all. Q: How many totems should I summon of each type? Q: I can't handle TA anymore. My merc just dies too frequently.
. The +20 additional minions will make TA safer for your merc. Q: How do you make the drop appear in the top left corner? A: Use D2stats. Go the menu at the top of this page, click on "Game"--> "Tools"--> D2stats Reader and download it. Rishab for the TA map. 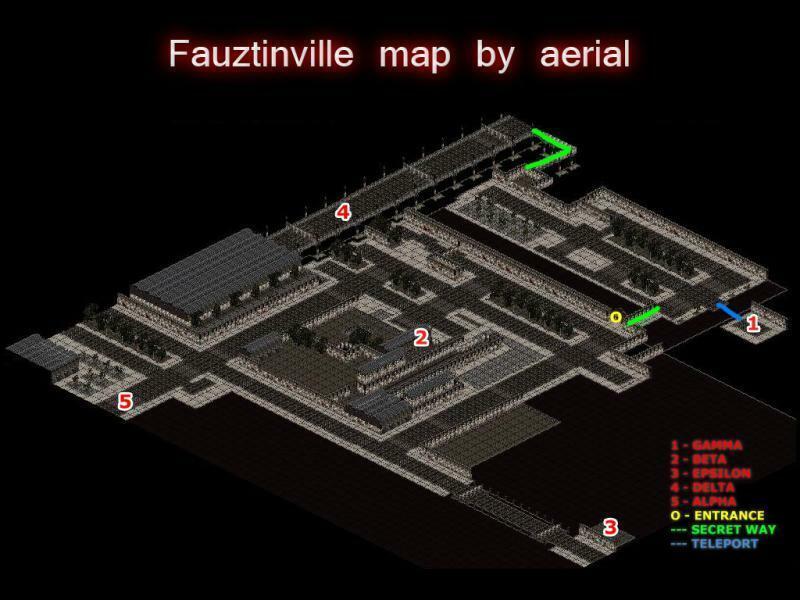 Aerial for the Fauztinville and Ureh map. LH for his tipps concerning guide writing. Stanley Kubrik for giving me the template for a fitting title. pro_zealot for finding out how minion life and minion resist work. SuchBalance for giving us insight on the mechanics of the game. I recommend adding something before Honorific in early gear section since they only makeable once you reach act 5 and can farm Shenk. Kotli wrote: I recommend adding something before Honorific in early gear section since they only makeable once you reach act 5 and can farm Shenk. Well done so far. Looking forward to see how you approach ubers. Just two notes: Isn't there a minion HP rollover where they can have a shitload of life but die in one hit? Also, crafted circlets can naturally spawn Minion HP and damage (Just to make sure you mark in your midgame section that they can also get better bonuses than just the shrines). L H wrote: Well done so far. Looking forward to see how you approach ubers. I just found Goetia Plate in TA. I tried Fauzt just now, and it's working so damn smooth. I'll definitely go ahead and try every uber with this build. Concerning the HP rollover: atm I'm checking how much HP it takes for the rollover. I'll add the limit once I find it. Yes, I'll add that to the list. EDIT: Minion Life cap is at around 86400. Excited to test this build, looks very reasonable, and nice to use the act 1 merc, should ge good untwinked, thanks!